The previous post on the homeownership rate prompted several questions about what happens when the boomers retire? This graph shows the homeownership by age group for three different time periods: 1985, 2000, and 2007. Back in 1985, the homeownership rate declined significantly after people turned 70. However, more recently, the homeownership rate has stayed above 80% for those in the 70 to 75 cohort, and close to 80% for people over 75. I expect the homeownership rate to remain high for the boomer generation too. 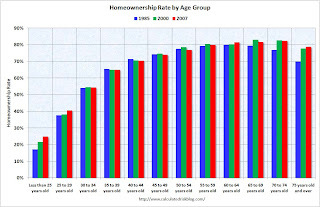 Although there will probably be a geographic shift as the boomer generation retires (towards the sun states) and some downsizing, I don't think the aging of the boomer generation will negatively impact the homeownership rate for 15 years or more. And that reminds me of an animation I made several years ago showing the U.S. population distribution by age from 1920 to 2000 (plus 2005). Animation updates every 2 seconds. The graphs for 1900 and 1910 have a similar shape as 1920. With the medical advances of the 20th Century, we would expect the shape of the distribution to become flatter as fewer people die of illnesses in the prime of their lives. The original baby bust. Although 1930 has the general shape of the previous decades, the first evidence of the Baby Bust is apparent. Although 1929 is usually considered the start of the Depression, there was a large segment of America that was struggling economically several years earlier. This shows up in the drop in births. With tough economic times, it is not surprising that many families postponed having children. Next comes the Baby Boom. The baby boom peaked in the mid-50s, and the 'Pig through a python' shape shows up in all the graphs. And finally a mini-baby bust. This followed the baby boom, but is nothing compared to the baby bust of the Depression.